My world of double bass, music and performance. Some time ago I had a session with Katrine Ring. We were improvising with the composition “Morfars sang” in my studio. This track is a mixture of a sound-collage that Katrine assembled of her now deceased grandfather humming his own little tune while doing some kitchen work and a double bass solo. We had performed the piece before on several occasions and I think it has even been played on Danish National Radio. However, we wanted to record a studio version and were just jamming a bit. I had not really set up the sound and I was playing on my Yamaha EUB. When I was playing I suddenly felt the presence of my, at that time, recently deceased grandmother. She was there in the studio. I loved her very much and she was a fun and outgoing character, and I felt her right there. The improvisation became very intense and the end result was an amazing powerful solo. So powerful that after careful consideration we agreed that this solo now was a new composition called “Grandmother” and not “Grandfather”. Since I started getting the upcoming album The Vibration ready I wanted to include this recording on the album. However, The recording quality proved too bad for my taste, so I took out 2 days to transcribe it(I will post the sheet music another day). Now I will record it again and make it the title work of the album. My vision of the composition “The Vibration” is that is has to contain samples from The big Bang, The Japanese Earthquake of 2011, The Pacific Ocean and The Atlantic Ocean. I have collected all of the samples now. The last sample was recorded by me at the Faroe Islands this weekend. It was very difficult to record as it was extremely windy almost all the time making it very difficult to get a clean recording. I went on a tour of Stremoy with my friend Agnar, but we could not find a place with less wind. 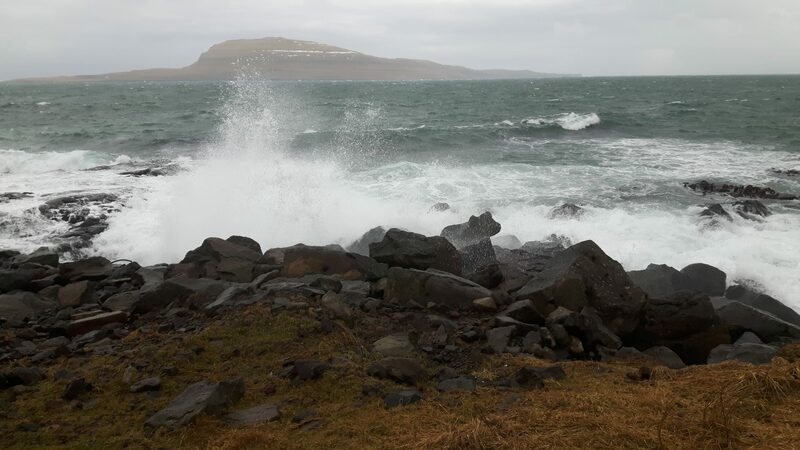 Then the last evening after the concert at Nordens Hus, the wind fell quiet and I went down to Torshavn harbor and recorded the sound of the majestic and crazy Atlantic Ocean hitting the rocks.